What do Oysters have to do with Rolex? Rolex was the first company to serially produce a watch that was impervious to day-to-day dust and water. Rolex was able to achieve this feat by patenting a caseback that screwed into the case, a crown that screwed into the case, and a bezel that screwed the then acrylic crystal onto the case. Prior this patent in 1927, watches were vulnerable to simple splashes of water, dust, and other contaminants that would make the oil in watches become less viscous thus reducing timing accuracy and overall reliability of the watch. 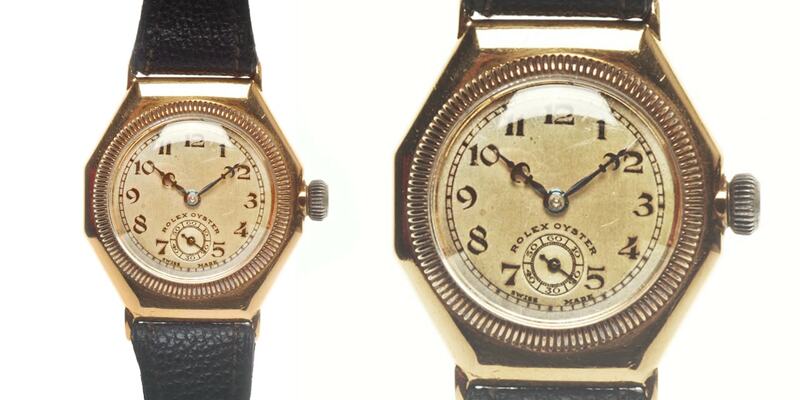 Hans Wilsdorf, Rolex’s founder called the watch case an oyster. The term came to Wilsdorf while at a dinner party while trying to pry open an oyster. Rolex Oyster cases requires special tools to open it, not unlike the necessity for special tools at an oyster bar. All Rolex watches, with the exception of the Cellini line, all possess the trademarked and patented Oyster case. Oyster cases are easy to distinguish in a crowd by the bezel that protects the watch crystal where it is pressed onto the case, the bubble caseback that is screwed into the back of the case, and the solid lugs that hold the bracelet to the case. The Oyster watch design is frequently copied yet is it as distinguishable as a Rolex as the five point Rolex crown. The development of the Oyster case was an important technological improvement to watchmaking. At the time, watches were press-fitted together, a design that was vulnerable to dust and water. Rather than having press fitted crystals, crowns, and casebacks, each one of these components threaded onto a rubber seal preventing water and dust penetration. Additionally, many people believed that wrist watches would not the day-to-day rigors of being on a wrist, unlike a pocket watch that is stored safely in a waist coat. Fortunately, Hans Wilsdorf’s perseverance for a design that would make watches reliable came to fruition. Soon after Wilsdorf perfected the Oyster case, he had Mercedes Gleitze, a 26 year old typist, wear a Rolex Oyster during her famous English Channel swim. Rather than telling people about the robustness of the Oyster case, Wilsdorf proved it with the English Channel swim. As the Rolex Oyster watch case continued to evolve, it became bigger, included more seals, and now possesses a separate bezel ring for sapphire crystals. Despite the 80 year evolution, Rolex continues to have a successful watch case that is water tight and easy to recognize.